• Get up early one morning, see the sunrise and listen to the country start to wake up. • Take your camera as we've got some of the best sunrises you'll ever experience. • Stop in at one of few but unique country pubs. Say 'cheers' with a cold drink and local experience. • Get the time right and you can experience the famous Pinnaroo Spudfest. 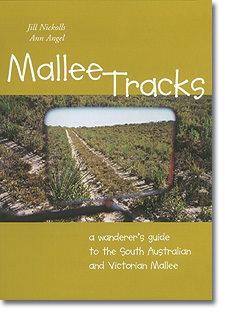 The authors have lived, taught and farmed in the Mallee country for more than 30 years. During this time have unearthed a wealth of information on the region's pioneers, flora and fauna, things to do and places of interest. Some of these places are well known, others can be considered to be off the 'beaten track'. Nineteen individual tours are described with detailed track notes pointing out places of interest along the way. There is a good mixture of 4WD and car touring options. A great feature of the book is background information on many of the old Mallee towns, some of which have survived and others which have gone, but not necessarily forgotten. The book reveals clues as to the identity of many former towns in the way of ruins, building sites, old graves, and neglected sporting grounds. Area of coverage includes Sunset Country, Big Desert, Wyperfeld, Mallee Highway, Pinnaroo, Ngarkat and Billiatt.